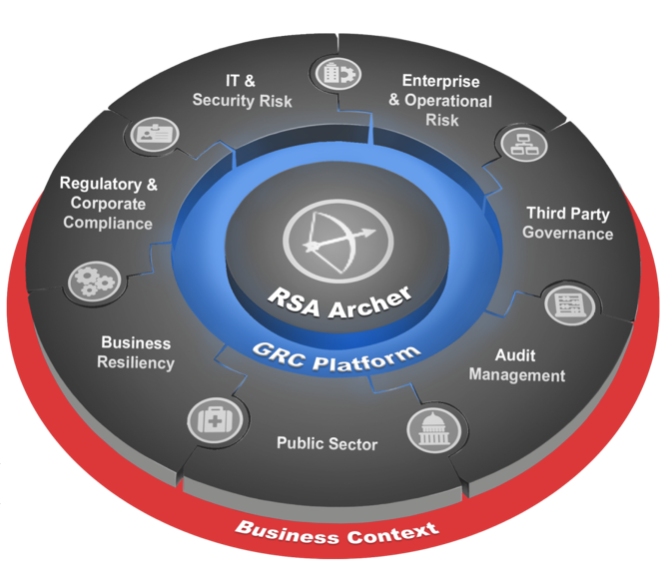 The RSA® Archer® GRC Platform supports business-level management of enterprise governance, risk and compliance (GRC). As the foundation for all RSA Archer GRC solutions, the Platform allows you to adapt a broad range of solutions to your requirements, build new applications, and integrate with external systems without touching a single line of code. RSA Archer helps to develop the organization's GRC program with solutions based on industry standards and best practices. Each solution is designed based on best practices and compliance standards as well as experience in building a corporate class. 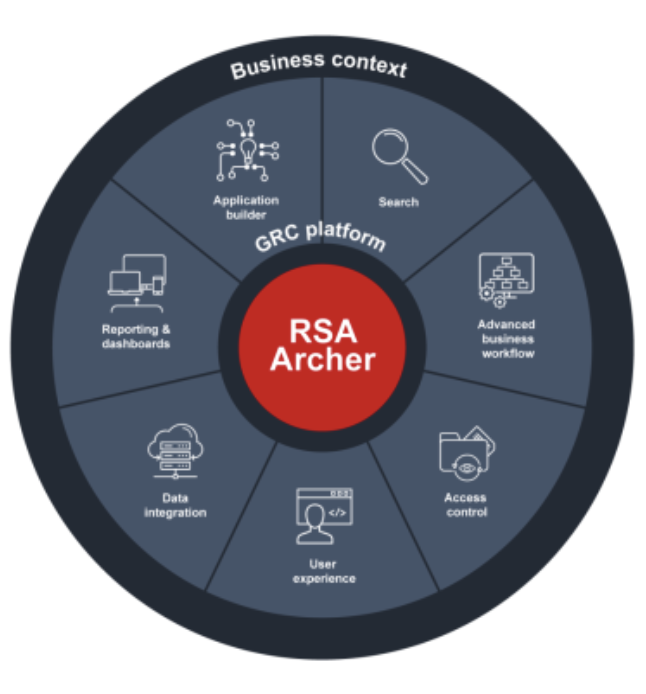 The RSA Archer GRC Platform provides a common foundation for managing policies, controls, risks, assessments and deficiencies across your lines of business. This unified approach eases system complexity, strengthens user adoption and reduces training time. The Platform enables cross-functional collaboration and alignment. Business users across IT, finance, operations and legal domains can work together in an integrated framework using common processes and data. 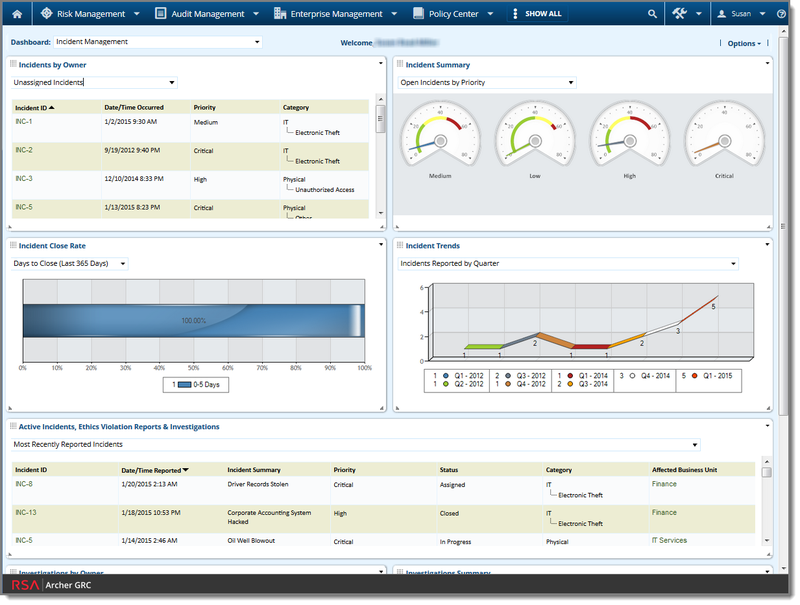 Non-technical users can automate processes, streamline workflow, control user access, tailor the user interface and report in real-time using the point-and-click interface to build and manage business applications. Define and automate business processes for streamlining the management of content, tasks, statuses and approvals. 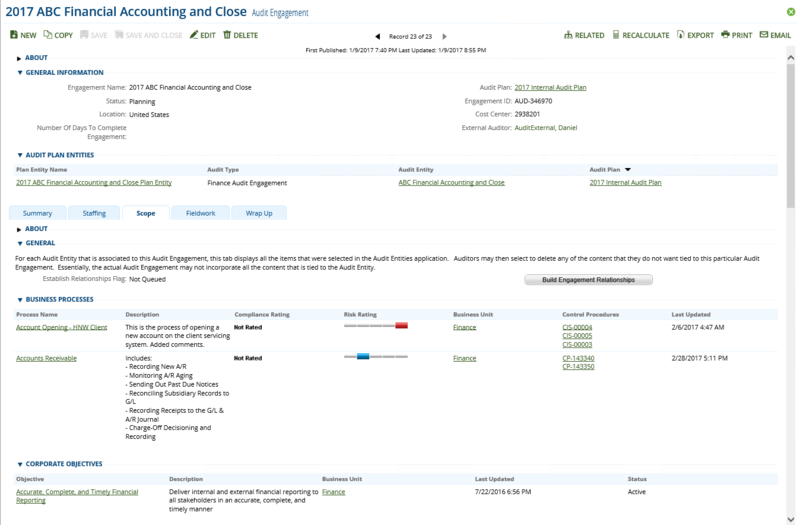 Track data retention schedules and execute a checklist based on Article 30 requirements as it relates to processing activities. Manage activities related to notifications and consents linked to the processing activity inventory. Maintain a register to help processing activities in accordance to directives and laws such as the GDPR Article 30 record keeping requirements. Many times, the audit team cannot focus on helping the business evaluate new risks and opportunities because they are spending time evaluating past performance of controls. Using RSA Archer Audit Management, you can incorporate more of a risk-based approach and collaborate with risk and compliance business partners. 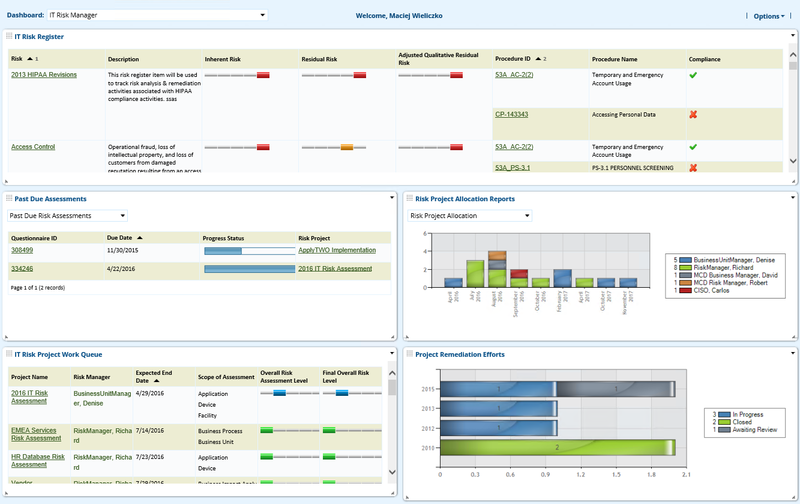 You can integrate the appropriate view of risk into evaluation of the most critical areas and controls, allowing you to focus on strategic business initiatives that show the audit team’s value to the organization. Lays the foundation for your GRC program to manage issues generated by audit, risk and compliance processes. The use case includes the Business Hierarchy to establish the corporate structure and accountability for risk and compliance Issues, and applications to manage findings, remediation plans and exceptions to address risks and associated resolutions. 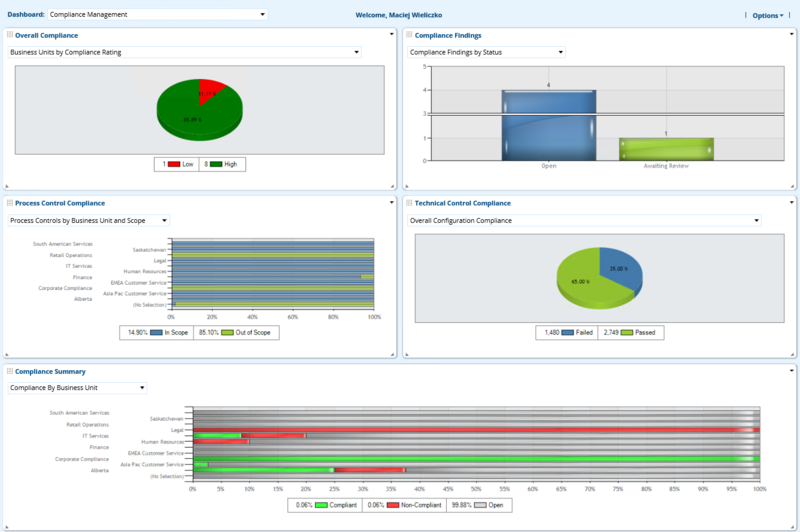 With RSA Archer Issues Management, you can create a consolidated view into known issues. With an organized, managed process to escalate issues, you get visibility into known risks and efforts to close and address risks. Workflow for proper sign-off and approval for issues, remediation plans and exceptions ensures identified issues are managed and mitigated. You will see quicker reaction to emerging risks creating a more secure and resilient environment while reducing costs. You can view the full use case on RSA. Perform audit engagements, maintain workpaper documentation, and report on audit results in a consistent, timely manner.Track expense reports and manage timesheets to staff your audit engagements with the right personnel. RSA Archer Audit Engagements & Workpapers helps transform the efficiency of your audit department, complete better scoped audits more quickly, and decrease external audit fees. You can view the full use case on RSA. 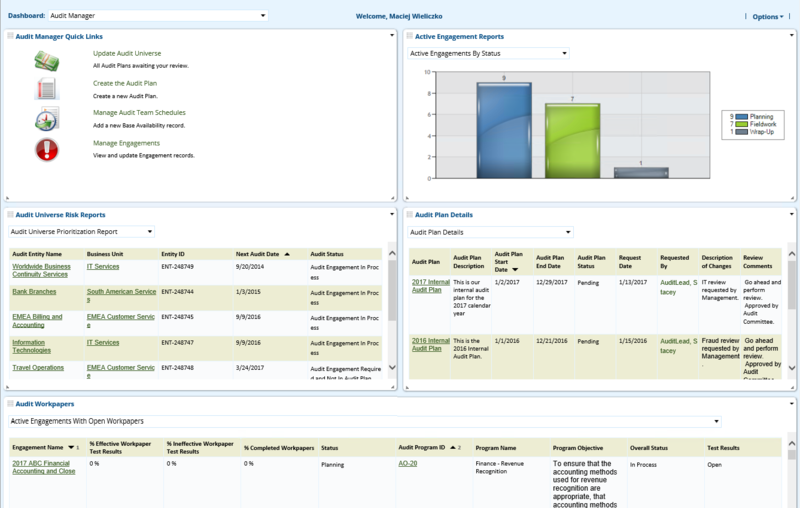 Enables internal audit teams to define their audit entities and universe, risk assess them, and plan for audit engagements during the coming year. Since RSA Archer Audit Planning integrates rich management risk and control information, Internal Audit can ensure their audit objectives are aligned with enterprise risk management and other related groups. Audit Planning & Quality puts you in control of the entire audit planning lifecycle, enabling improved governance of audit-related activities while also providing integration with your risk and control functions. RSA Archer Business Resiliency provides an automated approach to business continuity and disaster recovery planning and execution, enabling swift response in crisis situations to protect your ongoing operations. With RSA Archer, you can assess the criticality of business processes and supporting technologies, and develop detailed business continuity and disaster recovery plans using an automated workflow for plan testing and approval. 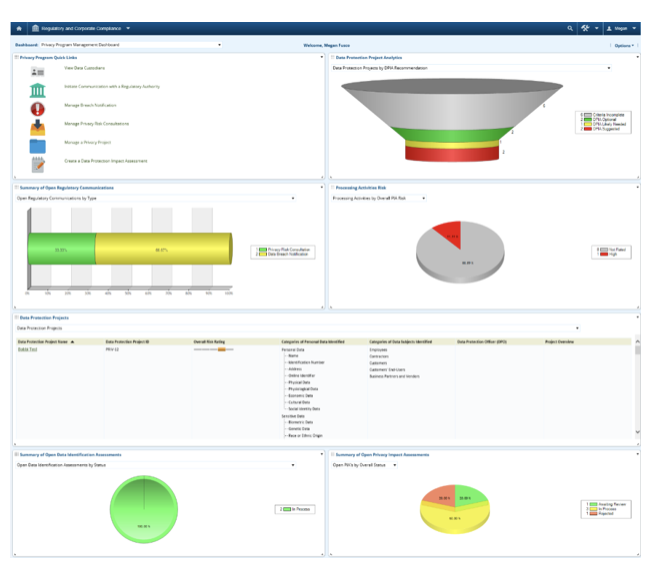 Key dashboards and reports provide visibility for your senior management, giving them a better understanding of continuity risks, insight into budget requirements, and a level of confidence that a solid resiliency program is in place if a crisis occurs. RSA Archer Business Resiliency provides several use cases to meet specific business needs and progress in the business resiliency maturity journey, including the following options. Enables the processes to address the flood of security alerts and implement a managed process to escalate, investiagte and resolve security incidents. 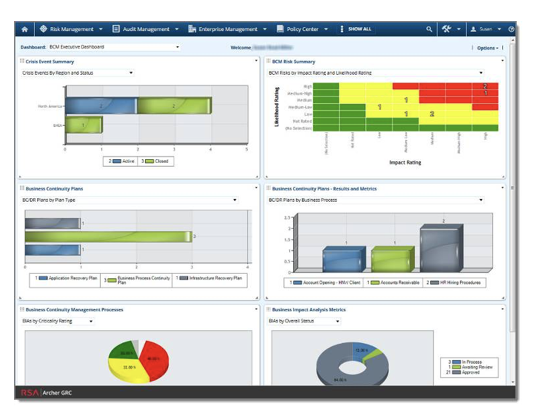 With RSA Archer® Operational Risk Management, you get a consolidated and clear view of risk that allows you to prioritize risks, efficiently deploy resources to address the most critical problems, and elevate risk management as a new source of competitive advantage. ORM provides tools and frameworks for risk specialists to identify, assessment, monitor and control operational risk. RSA Archer Enterprise & Operational Risk Management provides several use cases to meet specific business needs and progress in the audit maturity journey, including the following options. 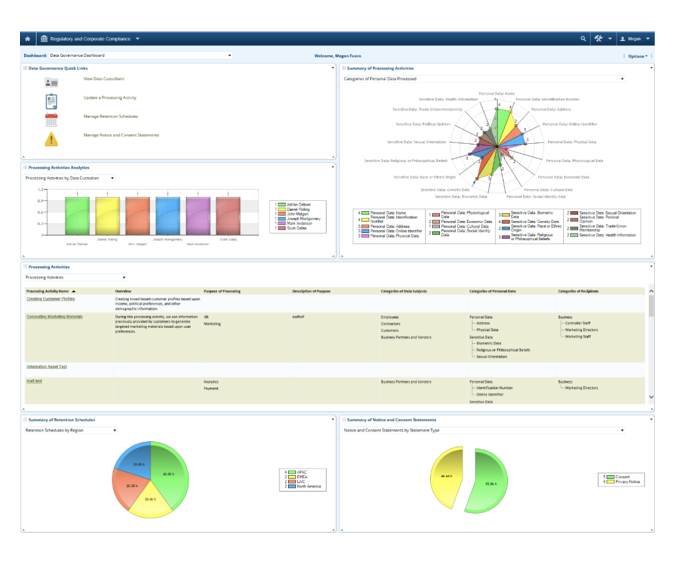 RSA Archer Operational Risk Management enables cataloging business processes and sub-processes, documenting risks associated with business processes, and mitigating controls. 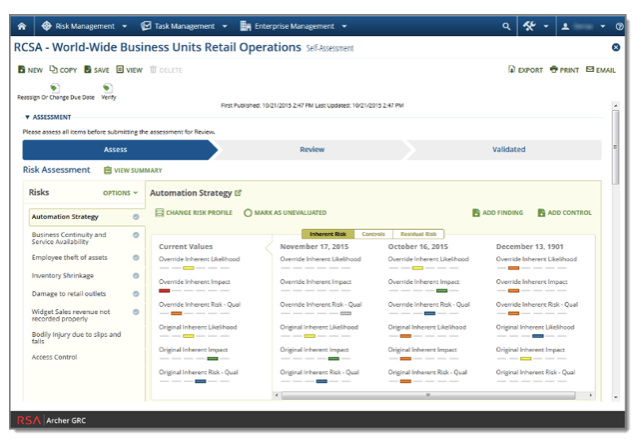 By integrating these use cases, risk managers have a comprehensive operational risk management program that reinforces desired accountability and risk management culture throughout the organization, providing necessary transparency through reporting, dashboards and notification alerts. RSA Archer® IT & Security Risk Management allows you to determine which assets are critical to your business, establish and communicate security policies and standards, detect and respond to attacks, identify and remediate security deficiencies, and establish clear IT risk management best practices. RSA Archer IT & Security Risk Management provides several use cases to meet your specific business needs as you mature your risk program, including the following options. Records Retention Utility tool is designed to meet Corporate Records Retention Requirements for Archer Customers. 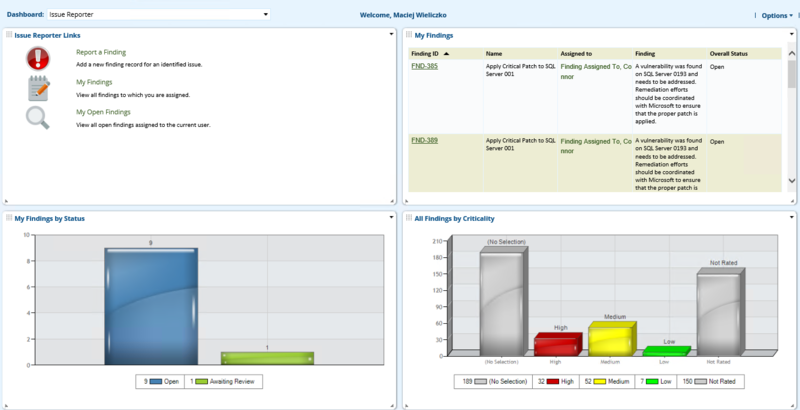 With a step by step user interface, users can now select records within any application or questionnaire and export defined records from a Global Report. 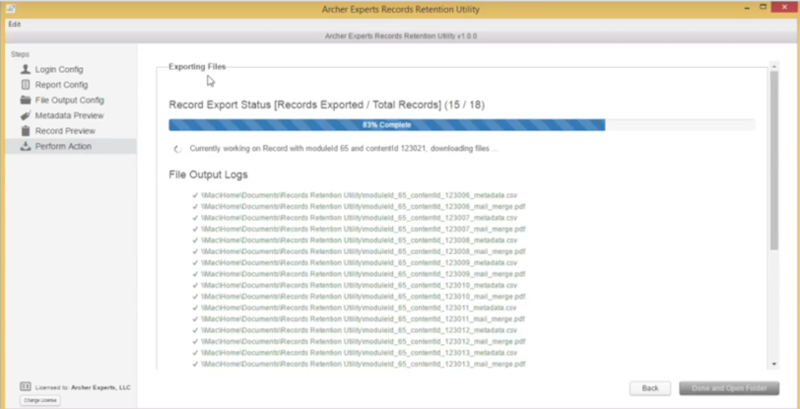 All records are exported in bulk as their own individual attachment using any of the Archer supported file formats or mail merge template. Fields defined within the Global Report are also selectable within the Utility and exported as meta-data from each record to a user-defined folder location as a CSV or JSON file. Once all attachments and meta-data have been exported to a folder location, Enterprise Document Management Systems such as EMC Documentum can automatically retrieve the data and apply appropriate records retention policies. I hereby agree to be contacted by GRC Advisory Sp. z o.o. SAP GRC Access Control migration to 10.1 version!